Garrett is the New Frontiers Programme Manager at Dundalk Institute of Technology (DkIT). An Electronic Engineering graduate from Dundalk Regional Technical College (now DkIT), Garrett has held management and senior engineering roles in a number of multinationals in Ireland, the UK and France. He also ran his own engineering contracting business, with a customer base in Ireland and the UK. With a young family at home and business requiring more and more trips abroad, Garrett took the decision to close his engineering business and follow a different dream. He launched Inside Business magazine, which served the eastern corridor from Dublin North to Louth, Newry and Mourne. Starting the magazine forced Garrett out of his comfort zone and made him widen his business networks and learn new skills. He also found time to complete an honours degree in Business. 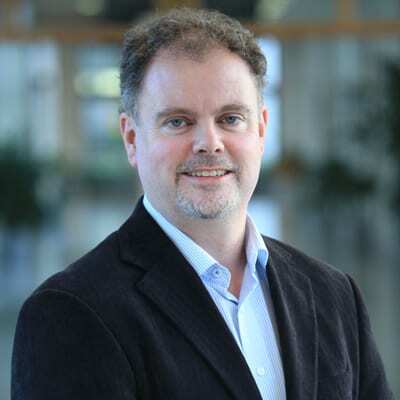 Garrett has worked as Enterprise Development Manager at DkIT’s Regional Development Centre since 2007, supporting over 300 technology startup entrepreneurs. He lectures in information systems, computer applications and new venture creation to DkIT undergraduates. He also set up StudentEnterprise @ DkIT, to encourage students to consider enterprise and business ownership as a career option. Founders are positive and creative people. They find solutions to their problems; nothing is insurmountable. I get to help them follow their business ownership dreams. Every success or failure provides an opportunity to learn, both for the participant and for the Programme Manager. Sharing the startup roller coaster ride is a privilege.